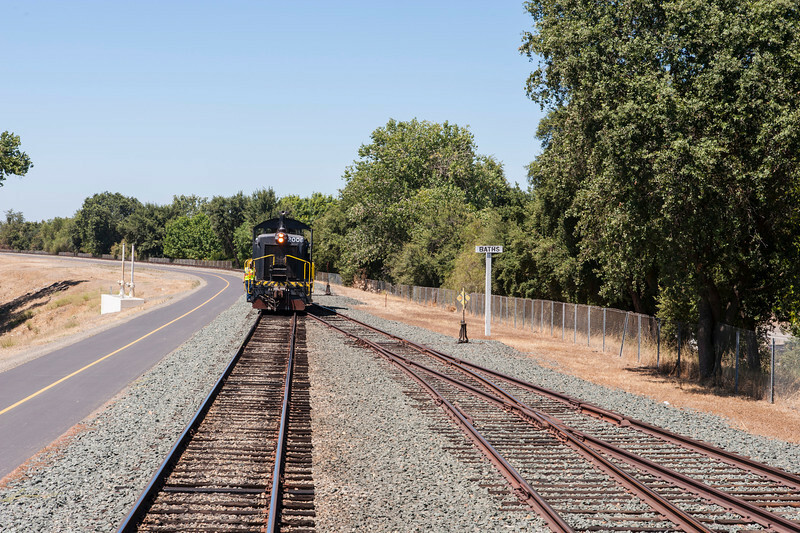 Saturday, July 6th, 2013 seemed like a good time to take Amtrak to Sacramento and visit the Sacramento Southern. I have never ridden that excursion train, even though I've been a member of the California State Railroad Museum for over 15 years. A freshly painted EMD SW8 diesel was our power for the day. Actually it made two runs before overheating, and Army Switcher 2008 was sent to pull the train back to the depot. I took two rides - the first I was in the open-air car and the second time I upgraded to first class and sat in the observation car. A young family was in line with me, and I noticed that the father (with a very attractive wife and two teenage daughters who could be models) had a Nikon D3s. They were speaking what sounded like French, but it was a different dialect.....then the conductor asked them where they were visiting from. Belgium. Home of Hercule Poirot...figures. All in all, a beautiful day weather-wise in Old Sacramento. The only thing that was a "downer" was finding out that a Boeing 777 lost its tail and crashed at SFO. After reaching Bath, the run-around happens where the power is detached from the consist, and switched to the adjacent track, then switched back to lead the train back. Here the power runs by our train and will be switched onto the main track and coupled to the observation car.